Último número de la Revue Critique de Droit International Privé: N°2 avril - juin 2010. Première Partie. — Doctrine et Chroniques. II. — CONDITION DES ÉTRANGERS. Maintien en rétention: Cour de cassation (1re Ch. civ. ), 9 décembre 2009, note Sabine Corneloup. III. — CONFLITS DE LOIS. Divorce: Cour de cassation (1re Ch. civ. ), 11 mars 2009, note Petra Hammje. Divorce: Cour de cassation (1re Ch. civ. ), 4 juin 2009, note H. M. W.
Loi étrangère: Cour de cassation (1re Ch. civ. ), 6 janvier 2010, note Paul Lagarde. IV. — CONFLITS DE JURIDICTIONS. Divorce: Cour de cassation (1re Ch. civ. ), 4 novembre 2009. Convention de Bruxelles du 27 septembre 1968: Cour de cassation (1re Ch. civ.). – 12 novembre 2009, note H. M. W.
Règlement (CE) n° 44/2001: Cour de justice des Communautés européennes (aff. C-420/07), 28 avril 2009, note Etienne Pataut. Règlement CE n° 44/2001: Cour de cassation (1re Ch. civ.). — 9 décembre 2009 et 6 janvier 2010, note B. A.
Corrección de errores del Real Decreto 716/2009, de 24 de abril, por el que se desarrollan determinados aspectos de la Ley 2/1981, de 25 de marzo, de regulación del mercado hipotecario y otras normas del sistema hipotecario y financiero. Nota: Véase el Real Decreto 716/2009, de 24 de abril, así como el comentario a esta disposición en la entrada de este blog del día 2.5.2010. Última entrega de la revista electrónica European Journal of Legal Studies: vol. 2 (2009), núm. 2. -Corrección de errores del Real Decreto Legislativo 1/2010, de 2 de julio, por el que se aprueba el texto refundido de la Ley de Sociedades de Capital. donde dice: «acciones.», debe decir: «acciones, cuya transmisibilidad podrá restringirse en los estatutos sociales.». donde se dice: «o las participaciones creadas», debe decir: «ni las participaciones creadas». donde se dice: «personal de la sociedad», debe decir: «personal de la empresa». donde dice: «conceder prestamos», debe decir: «conceder créditos o préstamos». donde dice: «2. Cuando la retribución no tenga como base», debe decir: «2. En la sociedad de responsabilidad limitada, cuando la retribución no tenga como base». en el artículo 263, se ha omitido un segundo apartado. donde dice: «Representación frente a los miembros del consejo de control», debe decir: «Representación frente a los miembros de la dirección». omitido el segundo apartado del artículo 499.
apartados 1 y 2 del artículo 502, donde dice «nuevo propietario», debe decir «nudo propietario». Véase el Real Decreto Legislativo 1/2010, de 2 de julio, así como la entrada de este blog del día 3.7.2010. -Corrección de errores del Real Decreto 830/2010, de 25 de junio, por el que se establece la normativa reguladora de la capacitación para realizar tratamientos con biocidas. Nota: Véase el Real Decreto 830/2010, de 25 de junio, así como la entrada de este blog del día 14.7.2010. -25 Years Without Borders. Prospects for police cooperation and border control in the Schengen area today (Trier, 16 September 2010 – 17 September 2010): 25 years ago, in 1985, five EU member states signed the Schengen Agreement removing systematic border controls between their countries. Today, the Schengen area consists of 25 European countries, the latest entrant being Switzerland. new electronic technologies to ensure border control (ABC). Together with representatives of the respective EU agencies, national police officers and border guards, this seminar will look at the development of the Schengen Acquis and present and discuss its challenges today. -Litigating European Union Law. Introductory course with preparatory e-learning modules (Trier, 22 September 2010 – 24 September 2010): The purpose of this course, which is aimed primarily at national legal practitioners, is to highlight the relevance of EU Law to the daily work of the national lawyer and to describe the various types of proceedings before the Union Courts (the Court of Justice, the General Court and the European Union Civil Service Tribunal) in which a national practitioner is likely to get involved. The participants will be able to deepen their knowledge through workshops. E-learning: Participants will be provided with the opportunity to prepare for the course online and test their knowledge via the ERA website. The e-learning course is now available for registered participants. Visit to the Court of Justice of the EU: The course includes a visit to the ECJ. The size of visitor groups to the ECJ in Luxembourg is strictly limited by the Court for practical reasons. Unfortunately we are therefore unable to guarantee that all participants will be able to attend. Places for the ECJ visit will be allocated to registered participants on a "first come, first served" basis. -Annual Conference on European Family Law 2010: Cross-border divorce - Family finances (Trier, 27 September 2010 – 28 September 2010): The 2010 edition of this annual conference on the latest developments in European family law will focus on both applicable law to divorce and matrimonial property regimes. In March 2010, the European Commission published its proposal for a Regulation implementing enhanced cooperation in the area of the law applicable to divorce and legal separation ('Rome III', COM (2010) 105). The second key topic concerns matrimonial property regimes and patrimonial aspects of other forms of union. A Commission proposal is expected later this year ('Rome IV'). Legal practitioners and academics will report on the current situation in several European jurisdictions. The discussion will include marital agreements and the proposal for an optional Franco-German matrimonial property regime. Finally, the state of play in the drafting of new legal instruments in the field of European family law and law of succession will be presented. -Annual Conference on European Consumer Law 2010. Focus on consumer rights: towards targeted harmonisation? (Trier, 14 October 2010 – 15 October 2010): The objective of this annual conference is to analyse the current state of EU consumer protection law and the most important recent EU initiatives in this field. The focus will be on consumer rights and the conference will debate the perspectives for a future Consumer Rights Directive. The European Commission in 2008 adopted a proposal for a Directive on consumer rights aiming at merging, updating, modernising and strengthening provisions in the key problematic areas of four existing EU consumer directives (consumer sales, unfair contract terms, distance selling and doorstep selling). According to the Commission, full harmonisation of all consumer rights in the EU would end the fragmentation of the single market, improve legal clarity, guarantee the same protection to all consumers and stimulate cross-border trade. Concerns have been raised, however, among member states, consumer organisations and Members of the European Parliament that a full harmonisation would in practice lead to a levelling down of certain consumer rights. Commissioner Reding has announced that she will review the Commission's 2008 proposal to consider, where practical, the option of more targeted harmonisation. -Annual Forum on Mutual Recognition of Judicial Decisions in Criminal Matters (Trier, 20 October 2010 – 22 October 2010): This three-day forum is the fifth annual event aimed at national judges and prosecutors on the subject of mutual recognition. This Europe-wide platform should enable judges and prosecutors to exchange experiences, discuss common problems and promote cooperation and best practice in the field of judicial cooperation in criminal matters. Relationship between national criminal law and EU criminal law. Proposals to improve the legal and/or practical functioning of EU mutual recognition instruments will be debated in light of the entry into force of the Lisbon Treaty and the endorsement of the Stockholm Programme. The contribution of EU institutions will be outlined and concrete EAW cases presented and discussed in working groups. the proposals to reform the existing EU instruments such as the Qualifications, the Procedures and the Reception Conditions Directives. The conference will discuss the further development of the role of the courts in the application of the EU asylum acquis. Level: The conference will offer an advanced level of discussion requiring knowledge of the EU refugee law acquis. -Europaisches Wirtschafts- und Steuerrecht: 2010, núm. 7. -Neue Juristische Wochenschrift - NJW: 2010, núm. 33. -Noticias de la Unión Europea: núm. 307 (2010). -Revista de Estudios Europeos: núm. 53 (2009). -Rivista di Diritto Internazionale: 2010, núm. 2. Nota: Véase la entrada de este blog del día 8.7.2010. -Asunto C-558/08: Sentencia del Tribunal de Justicia (Sala Primera) de 8 de julio de 2010 (petición de decisión prejudicial planteada por el Hoge Raad der Nederlanden — Países Bajos) — Portakabin Limited, Portakabin B.V./Primakabin B.V. [Marcas — Publicidad en Internet a partir de palabras clave («keyword advertising») — Directiva 89/104/CEE — Artículos 5 a 7 — Presentación en pantalla de anuncios a partir de una palabra clave idéntica a una marca — Presentación en pantalla de anuncios a partir de palabras clave que reproducen una marca con «pequeños errores» — Publicidad de productos de segunda mano — Productos fabricados y comercializados por el titular de la marca — Agotamiento del derecho conferido por la marca — Colocación de etiquetas con el nombre del comerciante y eliminación de las que llevan la marca — Publicidad, a partir de una marca ajena, de productos de segunda mano que incluyen, además de los productos fabricados por el titular de la marca, productos de origen distinto]. -Asunto C-233/09: Sentencia del Tribunal de Justicia (Sala Primera) de 1 de julio de 2010 (petición de decisión prejudicial planteada por el Hof van beroep te Antwerpen — Bélgica) — Gerhard Dijkman, Maria Dijkman-Lavaleije/Belgische Staat (Libre prestación de servicios — Libre circulación de capitales — Fiscalidad directa — Diferencias de trato según el lugar de la inversión o el depósito). Nota: Véase la entrada de este blog del día 1.7.2010. "1) El artículo 10, letra b), inciso iv), del Reglamento (CE) nº 2201/2003 del Consejo, de 27 de noviembre de 2003, relativo a la competencia, el reconocimiento y la ejecución de resoluciones judiciales en materia matrimonial y de responsabilidad parental, por el que se deroga el Reglamento (CE) nº 1347/2000, debe interpretarse en el sentido de que una medida provisional no constituye una «resolución sobre la custodia que no implique la restitución del menor», a efectos de la citada disposición, y no puede servir de fundamento para transferir la competencia a los órganos jurisdiccionales del Estado miembro al que el menor ha sido trasladado ilícitamente. 2) El artículo 11, apartado 8, del Reglamento nº 2201/2003 debe interpretarse en el sentido de que una resolución del órgano jurisdiccional competente que ordena la restitución del menor está comprendida en el ámbito de aplicación de dicha disposición, aun cuando no esté precedida de una resolución definitiva del mismo órgano jurisdiccional relativa al derecho de custodia del menor. 3) El artículo 47, apartado 2, párrafo segundo, del Reglamento nº 2201/2003 debe interpretarse en el sentido de que una resolución dictada posteriormente por un órgano jurisdiccional del Estado miembro de ejecución que atribuye un derecho de custodia provisional y se considera ejecutiva conforme al Derecho de dicho Estado no puede oponerse a la ejecución de una resolución certificada dictada anteriormente por el órgano jurisdiccional competente del Estado miembro de origen y que ordena la restitución del menor. 4) La ejecución de una resolución certificada no puede denegarse, en el Estado miembro de ejecución, por considerar que, debido a una modificación de las circunstancias acaecida tras haberse dictado, podría suponer un grave menoscabo del interés superior del menor. Tal modificación debe invocarse ante el órgano jurisdiccional competente del Estado miembro de origen, ante el cual deberá asimismo presentarse una eventual demanda de suspensión de la ejecución de su resolución." -Asunto C-283/10: Petición de decisión prejudicial planteada por la Înalta Curte de Casație și Justiție (Rumanía) el 7 de junio de 2010 — Circul Globus București (Circ & Variete Globus București/Uniunea Compozitorilor și Muzicologilor din România — Asociația pentru Drepturi de Autor — U.C.M.R. — A.D.A. b) también cualquier otra comunicación de una obra realizada directamente, en un lugar abierto al público, por cualquier forma de ejecución pública o de representación directa de la obra? Si la respuesta a la primera pregunta es a) ¿eso significa que los actos de comunicación directa de una obra al público mencionados en b) no entran en el ámbito de aplicación de dicha Directiva, o significa que no constituyen una comunicación de la obra al público, sino que son actos de representación y/o ejecución pública de una obra en el sentido del artículo 11, apartado 1, inciso i), del Convenio de Berna? Si la respuesta a la primera pregunta es b) ¿permite el artículo 3, apartado 1, de la Directiva que los Estados miembros establezcan por Ley una gestión colectiva obligatoria del derecho de comunicación pública de obras musicales, cualquiera que sea la forma de comunicación, pese a que ese derecho puede gestionarse individualmente y los autores lo gestionan de ese modo, sin prever que los autores puedan sustraer sus obras de la gestión colectiva?" -Asunto C-299/10: Petición de decisión prejudicial planteada por el Tribunal Judicial de Amares (Portugal) el 17 de junio de 2010 — Cristiano Marques Vieira/Companhia de Seguros Tranquilidade, S.A.
Cuestión planteada: "En caso de colisión entre vehículos y cuando el accidente, del que han resultado daños corporales y materiales para uno de los conductores (el lesionado, que reclama indemnización y es menor de edad), no pueda imputarse a ninguno de los conductores a título de culpa, ¿es contraria al Derecho comunitario y, en concreto, al artículo 3, apartado 1, de la Primera Directiva (72/166/CEE), al artículo 2, apartado 1, de la Segunda Directiva (84/5/CEE) y al artículo 1 de la Tercera Directiva (90/232/CEE), en la interpretación que de estas disposiciones viene realizando el Tribunal de Justicia, la posibilidad de establecer un reparto de la responsabilidad por riesgo (artículo 506, apartados 1 y 2, del Código Civil) que tiene reflejo directo en la cuantía de la indemnización que debe atribuirse al lesionado por los daños patrimoniales y no patrimoniales derivados de las lesiones corporales sufridas, por cuanto implica la reducción de esta cuantía en igual proporción?" Nota: Las tres Directiva citadas fueron derogadas con efectos 26.10.2009 por la Directiva 2009/103/CE del Parlamento Europeo y del Consejo, de 16 de septiembre de 2009, relativa al seguro de la responsabilidad civil que resulta de la circulación de vehículos automóviles, así como al control de la obligación de asegurar esta responsabilidad. -Asunto C-300/10: Petición de decisión prejudicial planteada por el Tribunal da Relação de Guimarães (Portugal) el 17 de junio de 2010 — Vítor Hugo Marques Almeida/Companhia de Seguros Fidelidade-Mundial, S.A., Jorge Manuel da Cunha Carvalheira, Paulo Manuel Carvalheira, Fundo de Garantia Automóvel. c) teniendo también en cuenta que, al no disponer uno de los vehículos implicados de ningún seguro válido y eficaz contratado con alguna aseguradora en la fecha en que se produjo el siniestro, la acción se dirige, además de contra la aseguradora del otro vehículo implicado, contra el propietario del vehículo sin seguro, contra su conductor y contra el Fundo de Garantia Automóvel, los cuales, por tratarse de responsabilidad objetiva, pueden verse solidariamente obligados al pago de la indemnización?" Orden EHA/2264/2010, de 20 de julio, por la que se dictan normas e instrucciones técnicas para la formación del censo electoral de residentes en España que sean nacionales de países con Acuerdos para las elecciones municipales. Nota: Véase el art. 176.1 de la Ley Orgánica 5/1985, de 19 de junio, del Régimen Electoral General, así como el Real Decreto 202/1995, de 10 de febrero, por el que se dispone la formación del censo electoral de extranjeros residentes en España para las elecciones municipales. Se deroga la Orden de 23 de diciembre de 1998 por la que se dictan normas e instrucciones técnicas para la formación del censo electoral de extranjeros residentes en España, para las elecciones municipales. Corrección de errores del Real Decreto 560/2010, de 7 de mayo, por el que se modifican diversas normas reglamentarias en materia de seguridad industrial para adecuarlas a la Ley 17/2009, de 23 de noviembre, sobre el libre acceso a las actividades de servicios y su ejercicio, y a la ley 25/2009, de 22 de diciembre, de modificación de diversas leyes para su adaptación a la Ley sobre el libre acceso a las actividades de servicios y su ejercicio. Nota: Esta es la segunda corrección de errores --y ¡qué corrección!-- del Real Decreto 560/2010, de 7 de mayo. Véase la primera corrección de errores, así como las entradas de este blog del del día 22.5.2010 y del día 19.6.2010. Nota: Véase la Iniciativa de la República Checa, la República de Polonia, la República de Eslovenia, la República Eslovaca y el Reino de Suecia con vistas a una Decisión marco 2009/…/JAI del Consejo sobre la prevención y resolución de conflictos de jurisdicción en los procedimientos penales. Véase la entrada de este blog del día 18.2.2009. En el Asunto Bélgica c. Suiza, iniciado ante la Corte Internacional de Justicia por el primer país debido a la incorrecta interpretación y aplicación por los tribunales suizos del Convenio de Lugano de 16 de septiembre de 1988, relativo a la competencia judicial y a la ejecución de resoluciones judiciales en materia civil y mercantil, la CIJ había fijado el pasado mes de febrero los plazos para la presentación de los escritos iniciales del proceso escrito. Así, el 23.8.2010 era la fecha límite para que Bélgica presentara su memoria y el 25.4.2011 expiraba el plazo para la presentación de la contramemoria por Suiza. Previa petición del Gobierno belga de ampliación de los anteriores plazos y con la conformidad del Gobierno Suuizo, el Presidente de la CIJ, mediante Providencia de 10 de agosto, ha ampliado hasta el 23 de noviembre de 2010 el plazo para la presentación de la memoria belga y el 24 de octubre de 2011 la presentación de la contramemoria suiza. Véase la nota de prensa emitida por la CIJ [versión inglesa] [versión francesa]. Sobre este Asunto véanse las entradas del blog de día 24.12.2009 y de día 18.2.2010. Pues sí, tras 30 meses de funcionamiento he decidido cambiar la presentación de Conflictus Legum para intentar evitar que la rutina (formal) no derive en cansancio. Después de hacer múltiples pruebas y darle muchas vueltas, he optado por este diseño, que me parece adecuado, informal, alegre y, a la vez, con cierto empaque, como corresponde a un blog dedicado al aburrido mundo del Derecho Internacional Privado. En la página principal podéis encontrar las últimas siete entradas publicadas. Si queréis consultar entradas anteriores, podéis bien retroceder pulsando el enlace "Entradas antiguas" del final de la página. Para avanzar, pulsar "Entradas recientes". También podéis utilizar la función "Archivo del blog" de la columna de la izquierda. Allí encontraréis el índice abreviado de entradas clasificadas por años y por meses. Pulsando sobre el mes, se cargan las entradas del mes y si lo hacéis sobre una entrada concreta se carga solamente esa entrada. La función "etiquetas" facilita mucho la búsqueda, pues cada entrada tiene atribuida una o más etiquetas relacionadas con su contenido. Así, por ejemplo, si pulsáis sobre la etiqueta "Reglamento Bruselas I", se os cargarán en la página principal las entradas que llevan esa etiqueta. El blog cuenta con hasta tres buscadores: el de la barra de estado (arriba del todo), el de la columna de la izquierda (Google) y la pestaña situada en la parte derecha del blog ("Search PAX"). Esta última se activa pulsando sobre ella, desplegándose entonces la pestaña de búsqueda. He podido comprobar que los buscadores que mejor funcionan son el de la columna de la izquierda y el de la pestaña, por este orden (el de la barra de estado no es muy fino, la verdad). Si os falla el de Google --parece tener un funcionamiento ciclotímico, pues hay días que funciona peor que otros-- podéis acudir después al de Pax, o incluso utilizar los dos. El blog realiza un seguimiento automático de las noticias publicadas en algunos blogs que he seleccionado por su interés. Los resultados del seguimiento los encontraréis en la funcionalidad "Destacamos... (últimas referencias)", situada en la columna de la izquierda. Otras funcionalidades a destacar son los enlaces a documentos de interés --se sobreentiende que para el Derecho Internacional Privado-- ("Documentos") y a algunas páginas web o blogs relacionados con el mundo jurídico ("Algunos enlaces"). Igualmente encontraréis algunos enlaces relacionados con el imprescindible mundo de la solidaridad ("Enlaza con la solidaridad"). Si queréis recibir puntual información de las entradas publicadas en el blog, podéis suscribiros mediante el sistema RSS tanto a las entradas como a sus comentarios, o a ambos ("Suscribirse mediante RSS" de la columna de la izquierda). Si preferís suscribiros mediante el formato "Atom", encontraréis el enlace al final de la página. En estos casos, la información que recibiréis es prácticamente instantánea. Si lo que deseáis es suscribiros a un servicio de distribución de información, podéis utilizar la opción "Suscríbete y recibirás las entradas por correo electrónico". De este modo, cada día recibiréis en la dirección que proporcionéis al suscribiros un correo electrónico con la entradas publicadas el día anterior, si las hay. La empresa que proporciona el servicio es "Feedblitz". Cuando queráis enviar la entrada a alguien (amigo o enemigo) --incluso, a vosotros mismo--, podéis hacerlo pulsando sobre el icono que representa un sobre y que está ubicado al final de la entrada en cuestión. También podéis realizar libremente comentarios a las entradas. Para ello, pulsáis sobre la palabra "comentarios", en la parte de abajo de la entrada, y se os cargará la página con la entrada y la casilla para escribir vuestras opiniones. Para aquellos visitantes que deseen traducir el contenido de las entradas, pueden hacerlo mediante "Google Translate", situado en la columna de la izquierda. Se trata de una traducción automática, por lo que os ruego no os pongáis exigentes con el resultado. Finalmente, si deseáis cotillear un poco --todos somos humanos--, podéis dar rienda suelta a vuestra curiosidad con distintas funcionalidades situadas en la columna de la izquierda: contador de visitas recibidas, mapa de situación de los visitantes del blog, incluso mi fotografía en el Parque Eduardo VII de Lisboa. Creo que no me he dejado ninguna de las funcionalidades y servicios que os ofrece Conflictus Legum. He aprovechado el lifting del blog para recordároslas, o incluso descubríroslas si no las conocíais aún. Creo que el nuevo formato no os tiene que plantear problemas técnico, pues se trata de una de las plantillas de amplia difusión y previamente probadas (testadas, dicen ahora los cursis), que proporciona el alojador del servicio (Google). Os pido un poco de paciencia al principio, hasta que os acostumbréis a la nueva presentación. Espero que os gusten los cambios y que sigáis visitando Conflictus Legum, pues, al fin y al cabo, los lectores/visitantes sois los destinatarios del blog. 12 hs. : Lectura de comunicaciones. Véase la entrada de este blog del día 19.6.2010. Neue Juristische Wochenschrift - NJW: 2010, núm. 32. Ley 25/2010 de la Comunidad Autónoma de Cataluña, de 29 de julio, del libro segundo del Código civil de Cataluña, relativo a la persona y la familia. Nota: En esta Ley cabe destacar los artículos 235-44, 235-45 y 235-46, en los que se regula la adopción y acogimientos internacionales. La Ley 9/1998 de la Comunidad Autónoma de Cataluña, de 15 julio, del Código de familia. La Ley 10/1998 de la Comunidad Autónoma de Cataluña, de 15 de julio, de uniones estables de pareja. La Ley 19/1998 de la Comunidad Autónoma de Cataluña, de 28 de diciembre, sobre situaciones convivenciales de ayuda mutua. Esta ley entrará en vigor el 1.1.2011. Ley 29/2002 de la Comunidad Autónoma de Cataluña, de 30 de diciembre, primera Ley del Código civil de Cataluña. Deben tenerse en cuenta sus arts. 3, 4 y 5, en los que se explica el exótico sistema de numeración del Código civil. Ley 5/2006 de la Comunidad Autónoma de Cataluña, de 10 de mayo, del Libro Quinto del Código Civil de Cataluña, relativo a los derechos reales. Ley 4/2008 de la Comunidad Autónoma de Cataluña, de 24 de abril, por la que se aprobó el Libro Tercero del Código Civil de Cataluña, relativo a las personas jurídicas. Ley 10/2008 de la Comunidad Autónoma de Cataluña, de 10 de julio, del libro cuarto del Código civil de Cataluña, relativo a las sucesiones. 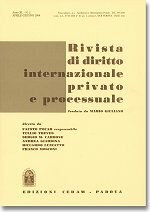 Rivista di Diritto Internazionale Privato e Processuale, vol. XLVI (2010), núm. 3, pp. 655-684. Sommario: 1. L'articolazione del foro della materia contrattuale contemplato dal regolamento (CE) n. 44/2001 secondo la giurisprudenza della Corte di giustizia. - 2. Le condizioni di applicabilità dell'art. 5 n. 1 lett. b del regolamento: l'interpretazione «induttiva» dei concetti di «compravendita di beni» e «prestazione di servizi». - 3. Segue: la «prestazione caratteristica», rappresentazione sintetica dell'operazione economica sottesa al contratto. - 4. Il metodo «pragmatico» di individuazione del locus solutionis elaborato per le liti soggette all'art. 5 n. 1 lett. b. - 5. Il significato dell'innovazione sancita dalla Corte, le condizioni alle quali essa può soddisfare gli obiettivi sottesi al forum solutionis e le garanzie che ne circondano l'operare. - 6. Segue: la determinazione convenzionale del luogo di adempimento dell'obbligazione rilevante. - 7. Segue: l'opportunità di ovviare, attraverso l'elaborazione di parametri uniformi sufficientemente articolati e precisi, ai limiti del metodo «pragmatico». - 8. Spunti per una valutazione di insieme dell'attuale assetto del forum solutionis alla luce dell'esperienza giurisprudenziale. Información relativa a la entrada en vigor del Acuerdo entre la Comunidad Europea y Antigua y Barbuda sobre exención de visados para estancias de corta duración. Nota: Véase la Decisión del Consejo, de 6 de abril de 2009, relativa a la firma y aplicación provisional del Acuerdo entre la Comunidad Europea y Antigua y Barbuda sobre exención de visados para estancias de corta duración. Véase igualmente el Acuerdo entre la Comunidad Europea y Antigua y Barbuda sobre exención de visados para estancias de corta duración. -Sentencia 31/2010 (Pleno), de 28 de junio de 2010: Recurso de inconstitucionalidad 8045-2006. Interpuesto por noventa y nueve Diputados del Grupo Parlamentario Popular del Congreso en relación con diversos preceptos de la Ley Orgánica 6/2006, de 19 de julio, de reforma del Estatuto de Autonomía de Cataluña. Función y contenido constitucional del Estatuto de Autonomía: Estatuto de Autonomía y sistema de fuentes; bloque de constitucionalidad, valor interpretativo del Estatuto de Autonomía; fundamento de la autonomía; derechos fundamentales y derechos estatutarios; sistema institucional autonómico, organización territorial y gobierno local; Poder Judicial; delimitación del contenido funcional y material de las competencias; relaciones de la Generalitat de Cataluña con el Estado y la Unión Europea; acción exterior; financiación autonómica y local; reforma del Estatuto de Autonomía. Eficacia jurídica del preámbulo; nulidad parcial e interpretación de preceptos legales. Votos particulares. Nota: Véase la entrada de este blog del día 9.7.2010. -Sentencia 9/2010 (Sala Primera), de 27 de abril de 2010: Recurso de amparo 1026-2004. Interpuesto por doña María Dolores y doña María Carmen Lloret Morera frente a las Sentencias de la Sala de lo Civil y Penal del Tribunal Superior de Justicia de Cataluña, de la Audiencia Provincial de Barcelona y de un Juzgado de Vilafranca del Penedés que desestimaron su demanda de reclamación de dominio por título hereditario. Vulneración del derecho a la igualdad y a no sufrir discriminación por razón de nacimiento: sentencias que interpretan un testamento de 1927 excluyendo a las demandantes del llamamiento a la herencia de su abuelo por su condición de hijas adoptivas. Voto particular. -Sentencia 212/2009 (Sala Primera), de 26 de noviembre de 2009: Recurso de amparo 4628-2006. Promovido por don Bolívar Alonso Teran Mejía frente a las Sentencias del Tribunal Superior de Justicia y de un Juzgado de lo Contencioso-Administrativo de Madrid que desestimaron su demanda contra el Delegado del Gobierno sobre su expulsión del territorio español. Supuesta vulneración del derecho a la tutela judicial efectiva: resolución administrativa que motiva la expulsión de un extranjero del territorio nacional, por carecer de documentación de residencia, valorando las circunstancias familiares (SSTC 260/2007 y 140/2009). Nota: Véase la entrada de este blog del día 15.1.2010. -Sentencia 199/2009 (Sala Primera), de 28 de septiembre de 2009: Recurso de amparo 4234-2007. Promovido por don Wilson Adran John respecto al Auto de la Sala de lo Penal de la Audiencia Nacional que, en procedimiento de orden europea de detención y entrega, acordó su entrega a Rumania. Supuesta vulneración del derecho a la tutela judicial efectiva y vulneración del derecho a un proceso con garantías: entrega de nacional británico, en virtud de euroorden, que desestima motivadamente alegaciones genéricas de riesgo de tratos inhumanos o degradantes (STC 140/2007); entrega para cumplir pena de prisión impuesta en juicio celebrado en ausencia del acusado, sin posibilidad de impugnación ulterior (STC 91/2000). Votos particulares. Nota: Véanse las entradas de este blog del día 14.10.2009 y del día 15.12.2009. -Sentencia 191/2009 (Sala Segunda), de 28 de septiembre de 2009: Recurso de amparo 2883-2005. Promovido por don Delmiro Darriba Rois respecto al Auto de la Sala de lo Penal de la Audiencia Nacional que, en procedimiento de orden europea de detención y entrega, acordó su entrega a Francia para cumplir una pena de prisión de veinte años. Alegada vulneración del derecho a la legalidad penal; supuesta vulneración del derecho a la tutela judicial efectiva: entrega de reo, en virtud de euroorden, concedida después de haber sido sobreseída provisionalmente una causa penal en España por los mismos hechos; motivación acerca de la prescripción del delito. Para la última relación de jurisprudencia constitucional véase la entrada de este blog del día 25.8.2009. -COM(2010)385 final (Bruselas, 20.7.2010): COMUNICACIÓN DE LA COMISIÓN AL CONSEJO Y AL PARLAMENTO EUROPEO - Panorama general de la gestión de la información en el espacio de libertad, seguridad y justicia. -COM(2010)343 final (Bruselas, 7.7.2010): COMUNICACIÓN DE LA COMISIÓN AL CONSEJO, AL PARLAMENTO EUROPEO, AL COMITÉ ECONÓMICO Y SOCIAL EUROPEO Y AL COMITÉ DE LAS REGIONES - Hacia una política global europea en materia de inversión internacional. -COM(2010)344 final (Bruselas, 7.7.2010): Propuesta de REGLAMENTO DEL PARLAMENTO EUROPEO Y DEL CONSEJO por el que se establecen disposiciones transitorias sobre los acuerdos bilaterales de inversión entre Estados miembros y terceros países. Nota: Véase la sentencia TJUE de 3.3.2009, en el Asunto C-205/06 (Comisión/Austria), la sentencia TJUE de 3.3.2009, en el Asunto C-249/06 (Comisión/Suecia), así como la sentencia TJUE de 19.11.2009, en el Asunto C-118/07 (comisión/Finlandia). Sobre el tema, véanse las entradas de este blog de día 3.3.2009 y de día 19.11.2009. -COM(2010)358 final (Bruselas, 5.7.2010): Propuesta de REGLAMENTO DEL PARLAMENTO EUROPEO Y DEL CONSEJO por el que se modifica el Reglamento (CE) n° 539/2001 por el que se establecen la lista de terceros países cuyos nacionales están sometidos a la obligación de visado para cruzar las fronteras exteriores y la lista de terceros países cuyos nacionales están exentos de esa obligación. Nota: Véase el Reglamento (CE) n° 539/2001 del Consejo, de 15 de marzo de 2001. -COM(2010)348 final (Bruselas, 1.7.2010): LIBRO VERDE DE LA COMISIÓN sobre opciones para avanzar hacia un Derecho contractual europeo para consumidores y empresas. -COM(2001) 398 final (Bruselas, 11.07.2001): COMUNICACIÓN DE LA COMISIÓN AL CONSEJO Y AL PARLAMENTO EUROPEO SOBRE DERECHO CONTRACTUAL EUROPEO. -COM(2003) 68 final (Bruselas, 12.2.2003): COMUNICACIÓN DE LA COMISIÓN AL PARLAMENTO EUROPEO Y AL CONSEJO UN DERECHO CONTRACTUAL EUROPEO MÁS COHERENTE PLAN DE ACCION. -COM(2004) 651 final (Bruselas, 11.10.2004): COMUNICACIÓN DE LA COMISIÓN AL PARLAMENTO EUROPEO Y AL CONSEJO - Derecho contractual europeo y revisión del acervo: perspectivas para el futuro. Circular 1/2010, de 28 de julio, de la Comisión Nacional del Mercado de Valores, de información reservada de las entidades que prestan servicios de inversión. Nota: Mediante esta disposición se define el contenido de la información que las entidades que prestan servicios de inversión deben remitir a la CNMV en virtud de los dispuesto en el Real Decreto 217/2008, de 15 de febrero, sobre el régimen jurídico de las empresas de servicios de inversión y de las demás entidades que prestan servicios de inversión y por el que se modifica parcialmente el Reglamento de la Ley 35/2003, de 4 de noviembre, de Instituciones de Inversión Colectiva, aprobado por el Real Decreto 1309/2005, de 4 de noviembre. a. Empresas de servicios de inversión mencionadas en el artículo 64 de la Ley 24/1988, de 28 de julio, del Mercado de Valores. b. Entidades de crédito mencionadas en el artículo 65 de la Ley del Mercado de Valores que presten los servicios de inversión o servicios auxiliares previstos en el artículo 63 de la citada Ley. 1) Las sucursales de empresas de servicios de inversión y entidades de crédito de Estados miembros de la Unión Europea. 2) Las sucursales de empresas de servicios de inversión y entidades de crédito de Estados no miembros de la Unión Europea. 3) Los agentes establecidos en España de las empresas de servicios de inversión y entidades de crédito de Estados miembros de la Unión Europea que operen en España a través de los mismos y que hayan realizado la correspondiente comunicación a la Comisión Nacional del Mercado de Valores de conformidad con lo dispuesto en el artículo 71 bis de la Ley del Mercado de Valores. 4) Las empresas de servicios de inversión y entidades de crédito de Estados no miembros de la Unión Europea autorizadas para prestar servicios de inversión en España sin sucursal." Véase Ley 24/1988, de 28 de julio, del Mercado de Valores. 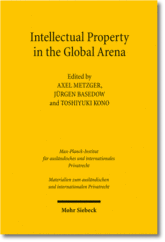 "Intellectual Property in the Global Arena. Jurisdiction, Applicable Law, and the Recognition of Judgments in Europe, Japan and the US", Ed. by Jürgen Basedow, Toshiyuki Kono and Axel Metzger, Mohr Siebeck, 2010. Das internationale Privatrecht des geistigen Eigentums wird zur Zeit in Europa und im Ausland viel diskutiert. Dieses Buch bietet eine vergleichende Analyse der drei wichtigsten Forschungsprojekte aus den USA, Europa und Japan. Sie decken jeweils Rechtsprechung, das angewandte Recht und die Durchsetzung ausländischer Entscheidungen ab. and the Recognition of Judgments in Europe, Japan and the US. -European Public Law: 2010, núm. 3. -Neue Juristische Wochenschrift - NJW: 2010, núm. 31. Nota: Véase la entrada de este blog del día 17.6.2010. -Asunto C-287/10: Petición de decisión prejudicial planteada por el Tribunal administratif (Luxemburgo) el 10 de junio de 2010 — Tankreederei I S.A./Directeur de l’administration des Contributions directes. Nota: Se trata de un asunto de obstaculización indirecta, mediante la normativa fiscal, al libre movimiento de capitales. -Asunto C-296/10: Petición de decisión prejudicial planteada por el Amtsgericht Stuttgart (Alemania) el 16 de junio de 2010 — Bianca Purrucker/Guillermo Vallés Pérez. "1) ¿Es aplicable la disposición del artículo 19, apartado 2, del Reglamento (CE) nº 2201/2003 del Consejo, relativo a la competencia, el reconocimiento y la ejecución de resoluciones judiciales en materia matrimonial y de responsabilidad parental («Bruselas II»), cuando al órgano jurisdiccional de un Estado miembro, ante el que una de las partes es la primera en presentar una demanda relativa a la responsabilidad parental, sólo se le solicita que resuelva sobre las medidas provisionales, y al órgano jurisdiccional de otro Estado miembro ante el que la otra parte presenta más tarde una demanda sobre el mismo objeto del procedimiento se le solicita que resuelva sobre el fondo? 2) ¿Debe aplicarse también la citada disposición cuando una resolución adoptada en el procedimiento aislado de medidas provisionales de un Estado miembro no pueda reconocerse en otro Estado miembro con arreglo al artículo 21 del Reglamento nº 2201/2003? 3) ¿Debe equipararse la presentación aislada de una demanda de medidas provisionales ante el órgano jurisdiccional de un Estado miembro a la presentación de la demanda sobre el fondo del asunto en el sentido del artículo 19, apartado 2, del Reglamento nº 2201/2003 cuando, con arreglo al Derecho procesal nacional de ese Estado, deba presentarse en un plazo determinado ante dicho órgano jurisdiccional la demanda para que resuelva sobre el fondo del asunto, a fin de evitar inconvenientes procesales?" Nota: Por Auto de 15.7.2010, se acordó tramitar el asunto a través del Procedimiento Prejudicial de Urgencia (PPU), regulado en el art. 104 bis del Reglamento de Procedimiento del Tribunal de Justicia. Véase la sentencia del TJUE de 15.7.2010, en el Asunto C-256/09 (Purrucker), así como la entrada de este blog del día 15.7.2010. Por lo visto, el matrimonio Purrucker/Vallés se vislumbra como digno sucesor del matrimonio De Cavel, igualando, de momento, con sus desavenencias mutuas, el número de casos planteados por estos últimos ante el Tribunal comunitario (asuntos 143/78 y 120/79). Ley 22/2010 de la Comunidad Autónoma de Cataluña, de 20 de julio, del Código de consumo de Cataluña. Nota: Esta norma tiene por objeto "garantizar la defensa y la protección de los derechos de las personas consumidoras y establecer, en el ámbito territorial de Cataluña, los principios y normas que deben regirlas para mejorar la calidad de vida de las personas consumidoras". El art. 122-2 contiene las obligación de los empresarios, entendiendo por tales a quienes, en su calidad de profesionales, produzcan, importen, distribuyan, manipulen o comercialicen bienes y servicios. El art. 126-13 se ocupa del acceso de las personas consumidoras a la información europea en materia de consumo. En el art. 128-1 se contiene los derechos lingüísticos de las personas consumidoras. Igualmente, el art. 211-5 reglamenta los requisitos lingüísticos en las relaciones de consumo. Los arts. 131 132 y 133 se ocupan de la resolución extrajudicial de litigios, centrados fundamentalmente en la mediación y el arbitraje de consumo. -Recurso de inconstitucionalidad n.º 1017-2010, en relación con diversos preceptos de la Ley del Parlamento de Cataluña 5/2009, de 28 de abril, de los recursos contra la calificación negativa de los títulos o las cláusulas concretas en materia de derecho catalán que deban inscribirse en un registro de la propiedad, mercantil o de bienes muebles de Cataluña. Nota: El Tribunal constitucional ha acordado "1.º Mantener la suspensión de los incisos «y al menos uno se basa en normas del derecho catalán o en su infracción» e «incluidos los que no aleguen la infracción de una norma del derecho catalán» del art. 3.4 de la Ley del Parlamento de Cataluña 5/2009, de 28 de abril, de los recursos contra la calificación negativa de los títulos o las cláusulas concretas en materia de derecho catalán que deban inscribirse en un registro de la propiedad, mercantil o de bienes muebles de Cataluña, así como, por conexión, del inciso «o junto con otros motivos» de su art. 1. 2.º Levantar la suspensión en lo restante de los arts. 1 y 3.4 y de los arts. 3.3 y 7.2." Véase la Ley 5/2009 de la Comunidad Autónoma de Cataluña, de 28 de abril, así como las entradas de este blog del día 27.2.2010. -Ley 4/2010 de la Comunidad Autónoma de Aragón, de 22 de junio, por la que se modifica la Ley 9/1998, de 22 de diciembre, de Cooperativas de Aragón. Nota: Véase la Ley 9/1998 de la Comunidad Autónoma de Aragón, de 22 de diciembre. Corrección de errores de la Adopción de una Decisión del Consejo por la que se establece la organización y el funcionamiento del Servicio Europeo de Acción Exterior (SEAE). Nota: Véase la Adopción de la Decisión del Consejo, así como la entrada de este blog del día 3.8.2010. A partir del próximo 15 de agosto será de aplicación la nueva versión del Reglamento de Arbitraje de la CNUDMI-UNICTRAL (Comisión de las Naciones Unidas para el Derecho Mercantil Internacional), aprobada el 25 de junio de 2010. El Reglamento vigente fue aprobado el 28 de abril de 1976 y constituye uno de los textos de mayor éxito en el ámbito del arbitraje, utilizándose para la solución de conflictos en un gran número de casos. Contiene un modelo de cláusula compromisoria y regula la designación de árbitros, la sustanciación de las actuaciones, así como la forma, efectos e interpretación del laudo. En el año 2006, la CNUDMI decidió revisar el Reglamento, con el objeto de adaptarlo a los cambios producidos en la práctica arbitral a lo largo de los últimos treinta años. Entre septiembre de 2006 y febrero de 2010, el Grupo de Trabajo sobre Arbitraje Internacional ha preparado el texto revisado, trabajando para ello en colaboración con organizaciones intergubernamentales y no gubernamentales. Por lo que se refiere a las novedades introducidas en la nueva versión del Reglamento, en la nota informativa de presentación se afirma: "They include more provisions dealing with, amongst others, multiple parties arbitration and joinder, liability, and a procedure to object to experts appointed by the arbitral tribunal. A number of innovative features contained in the Rules aim to enhance procedural efficiency, including revised procedures for the replacement of an arbitrator, the requirement for reasonableness of costs and a review mechanism regarding the costs of arbitration. They also include more detailed provisions on interim measures." -Ley 34/2010, de 5 de agosto, de modificación de las Leyes 30/2007, de 30 de octubre, de Contratos del Sector Público, 31/2007, de 30 de octubre, sobre procedimientos de contratación en los sectores del agua, la energía, los transportes y los servicios postales, y 29/1998, de 13 de julio, reguladora de la Jurisdicción Contencioso-Administrativa para adaptación a la normativa comunitaria de las dos primeras. Nota: Como se indica en el título de la norma, su objeto básico es adaptar la Ley 30/2007 y la Ley 31/2007 a la Directiva 2007/66/CE del Parlamento Europeo y del Consejo, de 11 de diciembre de 2007, por la que se modifican las Directivas 89/665/CEE y 92/13/CEE del Consejo en lo que respecta a la mejora de la eficacia de los procedimientos de recurso en materia de adjudicación de contratos públicos. El apartado veintiuno del artículo primero modifica el art. 130 de la Ley 30/2007, dando una nueva redacción a las letras c) y d) del art. 130.1, y pasando la actual letra d) a ser la letra e). El contenido de la letra e) permanece inalterado, previendo la sumisión expresa de las empresas extranjeras a los órganos jurisdiccionales españoles: "Para las empresas extranjeras, en los casos en que el contrato vaya a ejecutarse en España, la declaración de someterse a la jurisdicción de los juzgados y tribunales españoles de cualquier orden, para todas las incidencias que de modo directo o indirecto pudieran surgir del contrato, con renuncia, en su caso, al fuero jurisdiccional extranjero que pudiera corresponder al licitante." Esta Ley contiene diversas referencias a la publicación del anuncio de licitación en el DOUE, configurándose su inobservancia como un supuesto de nulidad contractual. Véanse los siguientes preceptos de la Ley 30/2007: art. 37.1.a) y art. 37.2.a) y b) [modificados por el artículo primero, número dos]; art. 39.3.a) [modificado por el artículo primero, número dos]; art. 138.2 y 3 [modificado por el artículo primero, número veinticinco]. Véanse igualmente los siguientes preceptos de la Ley 31/2007: art. 104.2 [modificado por el artículo segundo, número dos]; art. 109.1.a) y art. 109.2.a) y b) [modificados por el artículo segundo, número cuatro]; art. 111.3.a) [modificado por el artículo segundo, número cuatro]. De conformidad con la disposición derogatoria, quedan derogados los arts. 112 a 121, ambos inclusive, de la Ley 31/2007. Para finalizar, una observación de técnica legislativa. Esta Ley contiene dos disposiciones finales. En la primera se modifica el art. 30.2 del Texto Refundido de la Ley del Impuesto sobre Sociedades, en el que se regula la deducción por doble imposición sobre dividendos de fuente interna en el mencionado impuesto. En la segunda se modifica el art. 93.2 de la Ley 29/2006, de 26 de julio, de Garantías y Uso Racional de los medicamentos y productos sanitarios, sobre el sistema de precios de referencia. ¿Me quiere explicar alguien qué tienen que ver la Ley del impuesto sobre sociedades y la Ley de garantía y uso racional de los medicamentos y productos sanitarios con la reforma de la contratación pública realizada en el resto del articulado? Puede ser que ahora ya no se utilice la criticable técnica legislativa de las "leyes de acompañamientos" de la Ley de presupuestos generales del Estado pero, por lo que se ve, la técnica chapucera no nos abandona. -Orden AEC/2172/2010, de 13 de julio, por la que se regulan la constitución, elección y funcionamiento de los Consejos de Residentes Españoles en el Exterior. Nota: Véase los arts. 12 y 13 de la Ley 40/2006, de 14 de diciembre, del Estatuto de la Ciudadanía Española en el Exterior, así como el Real Decreto 1960/2009, de 18 de diciembre, por el que se regulan los Consejos de Residentes Españoles en el Extranjero, así como la entrada de este blog del día 2.1.2010. -Ley 7/2010 de la Comunidad Autónoma de Extremadura, de 19 de julio, de modificación de la Ley 3/2002, de 9 de mayo, de Comercio de la Comunidad Autónoma de Extremadura. Nota: Esta disposición modifica la Ley 3/2002 de la Comunidad Autónoma de Extremadura, de 9 de mayo, de Comercio de la Comunidad Autónoma de Extremadura, con el objeto de adaptarla a las previsiones liberalizadoras de la Directiva 2006/123/CE del Parlamento Europeo y del Consejo, de 12 de diciembre de 2006, relativa a los servicios en el mercado interior. -Ley 8/2010 de la Comunidad Autónoma de Extremadura, de 19 de julio, de Actividades Feriales de la Comunidad Autónoma de Extremadura. Nota: Al igual que la anterior, esta disposición legal adapta la correspondiente normativa autonómica a la la Directiva 2006/123/CE del Parlamento Europeo y del Consejo, de 12 de diciembre de 2006, para lo que procede a derogar la Ley 4/2001 de la Comunidad Autónoma de Extremadura, de 26 de abril, de Actividades Feriales de la Comunidad Autónoma de Extremadura. Cabe destacar su art. 6, en el que se establece que puede promover y organizar actividades feriales "cualquier persona física con la nacionalidad de cualquier Estado miembro de la Unión Europea, o residente legal en España, o cualquier persona jurídica o entidad constituida de conformidad con la legislación de un Estado miembro de la Unión Europea, cuya sede social o centro de actividad principal se encuentre dentro de la Unión Europea, que ofrezca o preste el servicio de promoción y/u organización de ferias". -Resolución de 11 de junio de 2010, de la Dirección General de los Registros y del Notariado, en el recurso interpuesto contra la nota de calificación del registrador de la propiedad de San Javier n.º 1, por la que se deniega la inscripción de dos resoluciones judiciales de declaración en quiebra, dictadas por un tribunal inglés. Nota: Véase el Reglamento (CE) nº 1346/2000 del Consejo, de 29 de mayo de 2000, sobre procedimientos de insolvencia.